Havelina Soap | Where soap meets every day life. 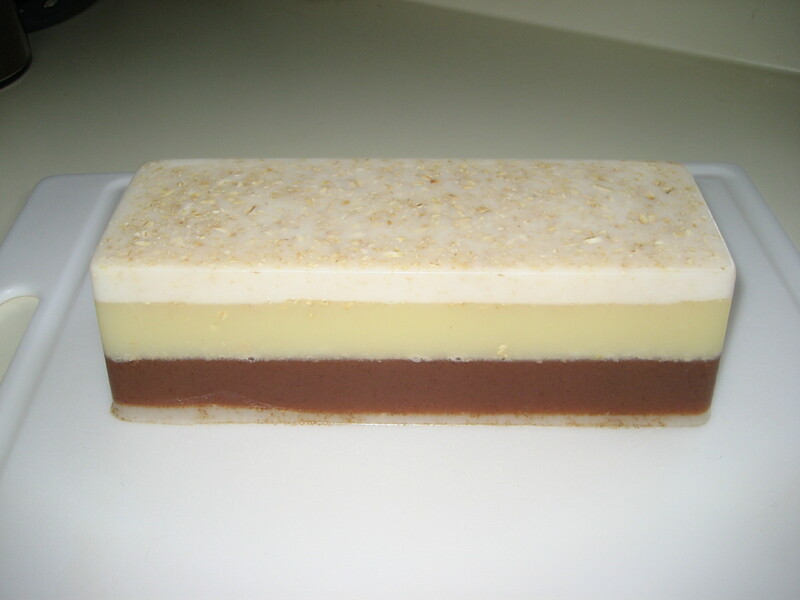 I’m finally back in the swing of things, home from Canada and back at work making soaps and other things. What are those other things you ask? I realize I haven’t posted in awhile and wanted to send out a quick update. I’m working on some new things for the business and it’s been keeping me super busy. Because of it, unfortunately, soap and other luscious things are on hold. This also means no holiday festivals this year. When the new unveiling comes, hopefully you’ll all love the changes as much as I do already. Until then, I’ll be posting off and on with my usual randomness. Soap, moisturizers, even some travel may get thrown in. Thanks to everyone who’s kept up with me and kept me sane over the last month. Lately I’ve been on a glycerin soap kick. I’ve been having a lot of fun playing with the different ingredients I can use to make glycerin soap do more than just clean. So when I got an email to participate in a soap swap, I was all excited about what I could make with the ingredients I had in my stash. I came up with a triple layer loaf that would be exfoliating and antibacterial. I decided I would use oatmeal, rosehip seed powder and honey powder. 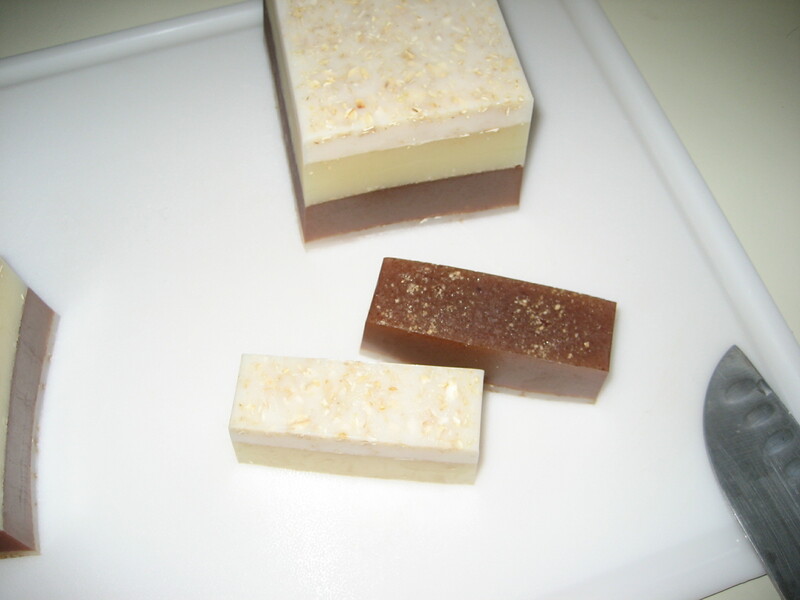 Oatmeal and rosehip seed powder are very gentle exfoliators and honey is highly antibacterial. 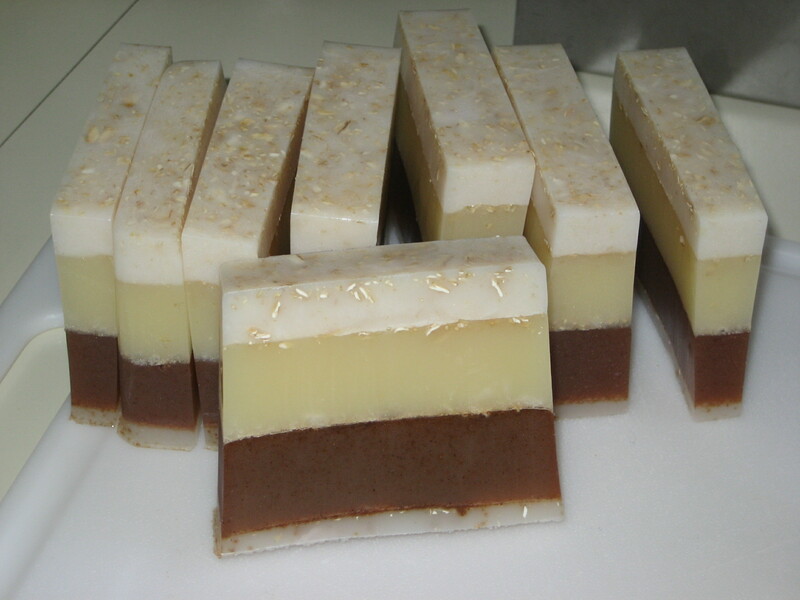 I also added a little olive oil and camellia oil to make the bars more moisturizing. I could not wait to see how these were going to turn out. 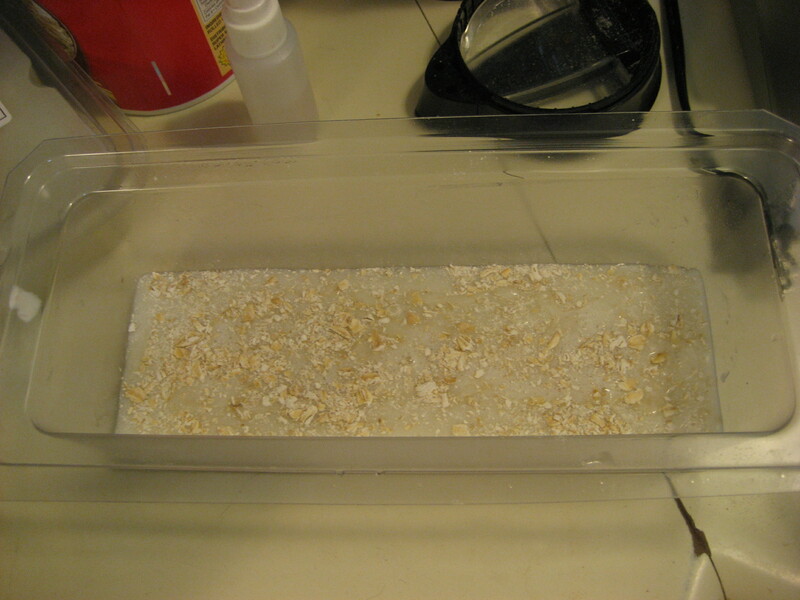 My first layer was a mix of oatmeal, white glycerin soap base, olive oil and fragrance oil. As I melted the soap, I used a coffee bean grinder to pulverize the oatmeal. 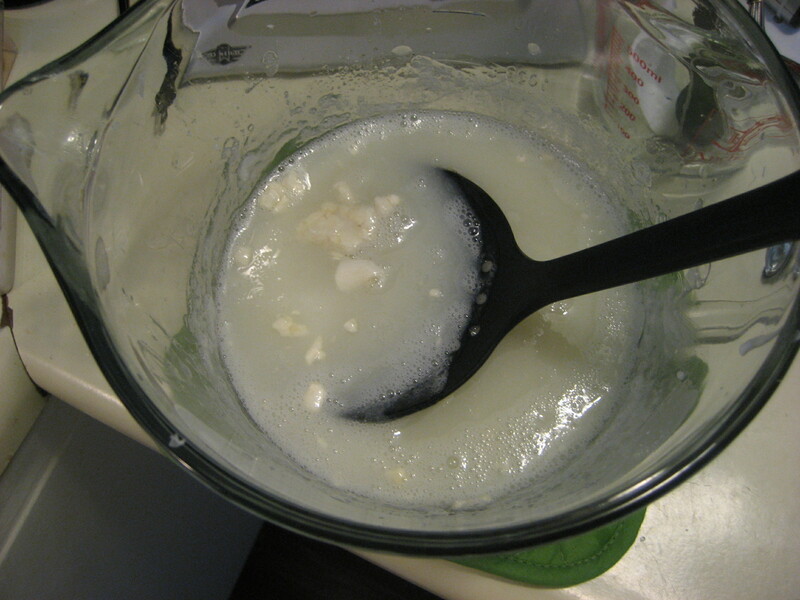 Once the soap was melted, I added in the olive oil, oatmeal and fragrance oil. This layer poured nice and easy. The second layer was the honey layer. As I melted the honey glycerin soap base, I measured out the amount of honey powder I wanted to use. As soon as the soap was melted, I dumped the honey powder in. And then it happened. Maaaaaaaaaaan. It got all clumpy. Um yeah. I had to fix this and fast. The soap was starting to harden up and if it did, there was no way I’d be able to get all the clumps out. I grabbed a slotted spoon and started digging the clumps out as fast as possible. And luckily I did get them all. 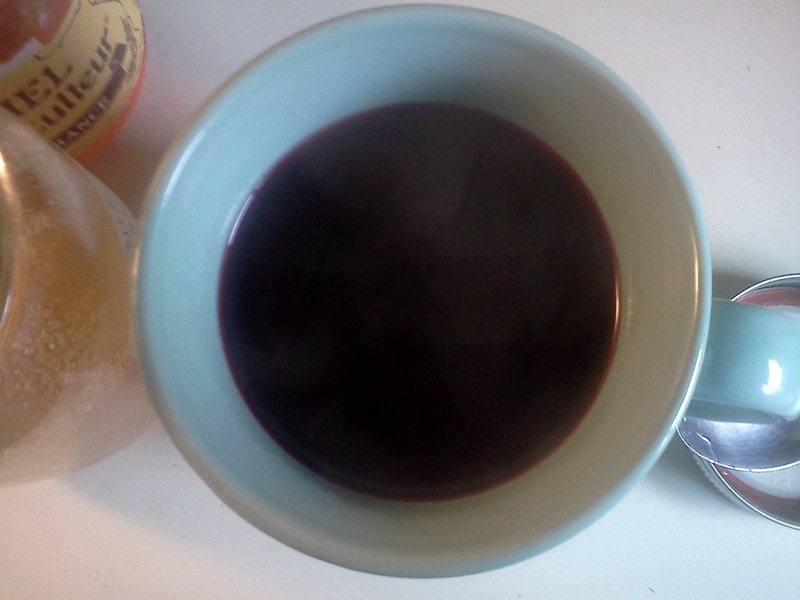 I think the mistake I made here was to not dilute the powder in oil first. Had I done that, the powder would have easily dispersed into the soap. I think it would have anyway. Since I had honey granules in the stash, I decided to use those instead. Honey granules are a lot more substantial than the powder, so by swapping these in, I was able to save the layer. The final layer was the rosehip seed layer. Rosehips are a gorgeous dark brick red color. Between the lighter oatmeal and honey layers, I knew this would be the perfect offset. 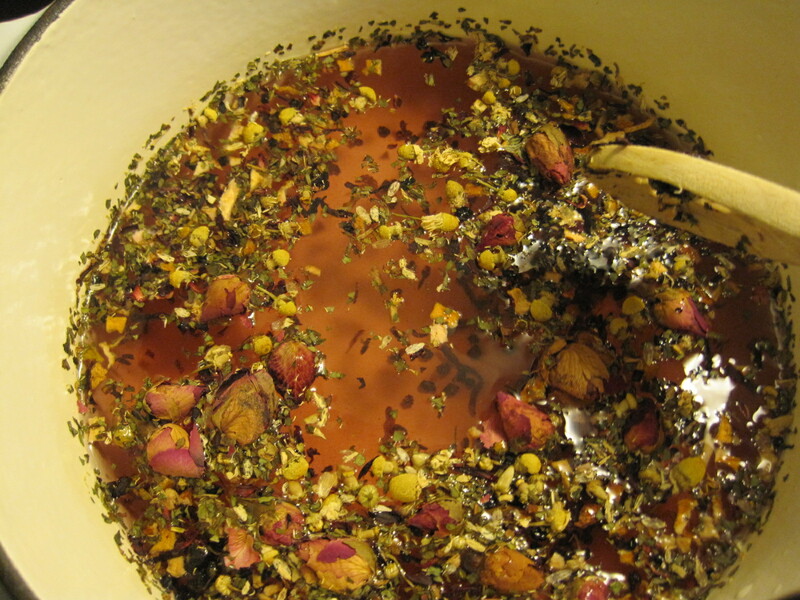 In addition to the rosehips, this layer was made with clear glycerin soap base, camellia oil and fragrance oil. 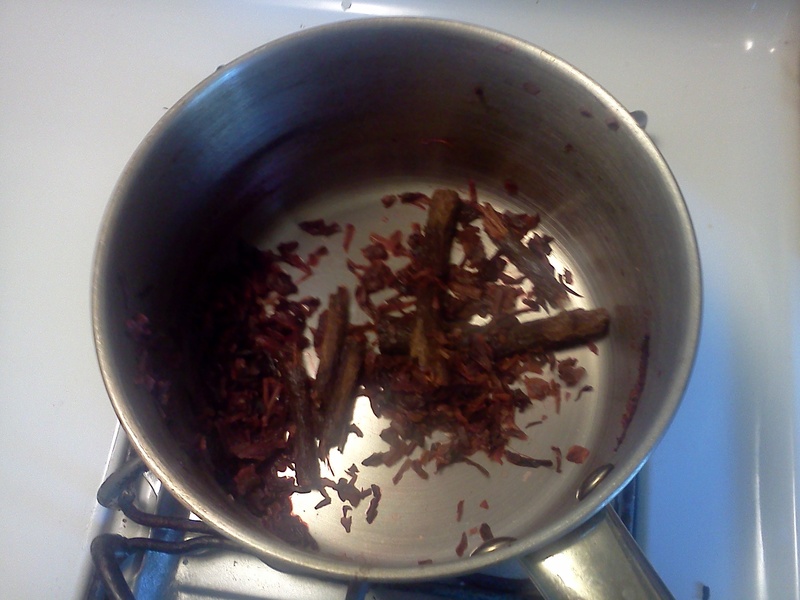 As I melted the soap base, I added the camellia oil to the rosehip seed powder. I was not about to have another “ai-yah” moment. Luckily for me, this layer worked as planned with no problems. And here is the finished loaf, cooling down and waiting to be cut. My bar broke in half between the layers. I was able to save some of the bars by “gluing” them back together. The “glue” is actually more glycerin soap melted and poured lightly in between the two things you want to glue back together. I’m not sure why my layers seperated other than maybe the temperatures weren’t right when I poured the layers. I’m pretty sure my friend Rose of Sugarloaf Soaps can tell me what I did wrong, but for now, I was happy that only 3 of the bars had issues. The rest were looking good. When I tested the bars, they came out exactly as I wanted. Light scrubbing action with super clean and soft hands. Luckily for me, this didn’t turn out too bad after all. My lemon tree is covered with aphids. My orange tree is still a baby. 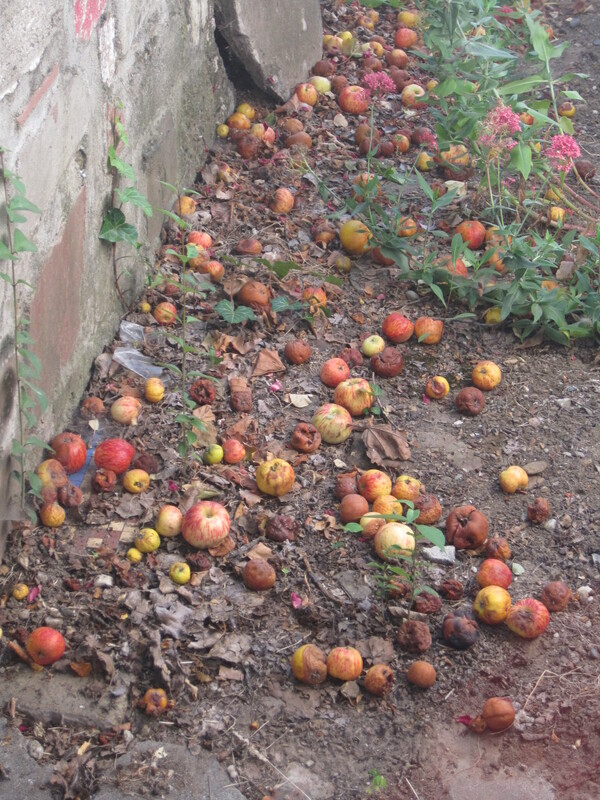 But my neighbor’s apple tree is putting out like a champ. For the last week or so, the tree has been dumping in the backyard and the side of our house. This has been going on every fall since we moved in and it really makes a big mess. My neighbor never offers to clean it up or to prune the tree back. Since the person didn’t want to do anything about it, I decided that I would. And here is my solution. 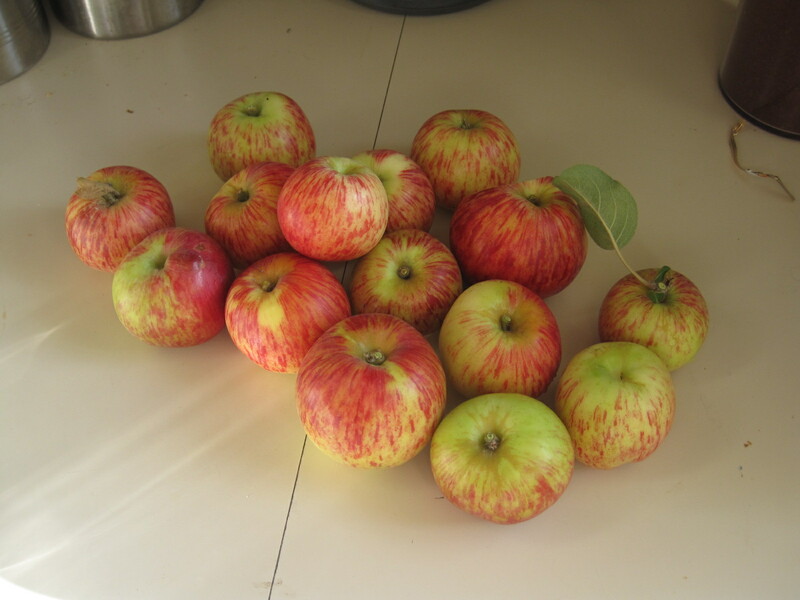 A trip to OSH and $21.99 later, I’ve got a nice little pile of apples to eat. In fact, I think we’re having pork chops with fried apples for dinner tonight. A few more picking sessions and the picker will have paid for itself. 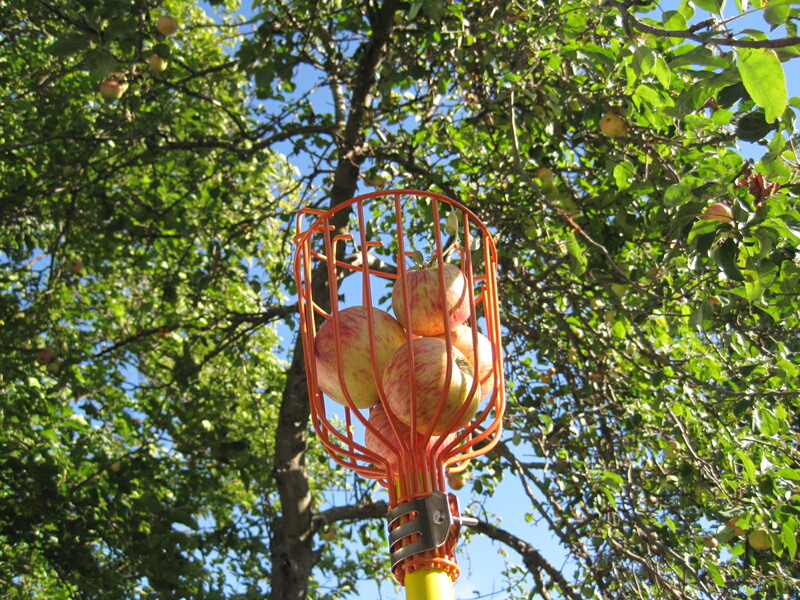 Pesticide free, non sprayed apples. Mmmmmmmmm…That’s what I’m talking about! So friends, the moral of this story is not to get mad when you have a lazy neighbor. The moral is to enjoy the hell out of the apples they are too lazy to take care of themselves. 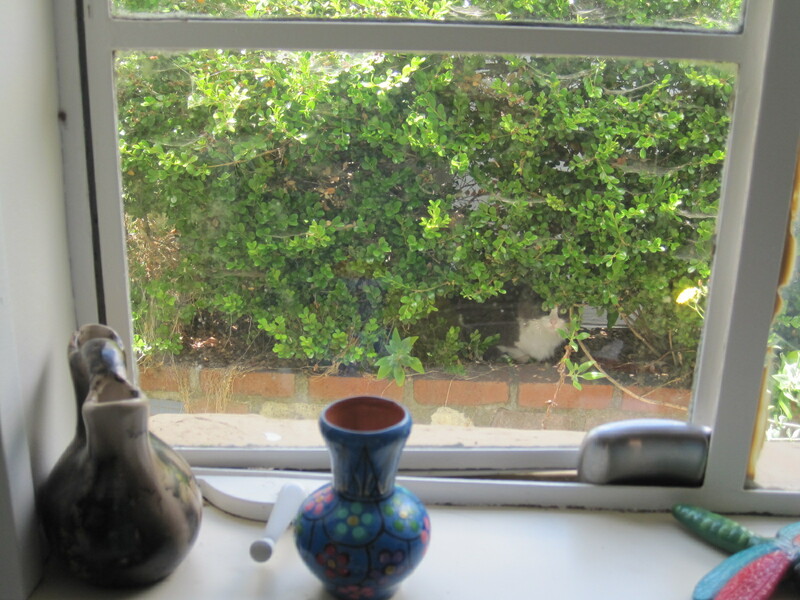 Who’s That Peepin’ Through My Window? This just cracks me up. I wonder if homeboy is hoping I’ll throw him some scraps. 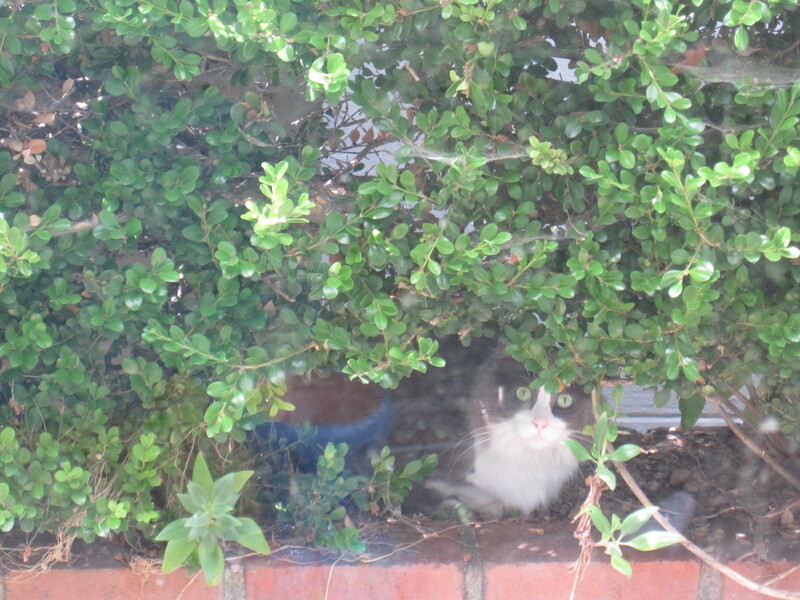 Whether it’s the apple tree (more on that later) or a cat(s), everything of our neighbor’s seems to find it’s way into our yard. Fernando asked me to start making more tea in an effort to decrease all the juice and other sugary filled drinks that we normally consume. Having a room full of herbs to pick from, I was more than happy to oblige. As I filled a jar full of things I love to drink, I realized how pretty it looked and how nice it would be to receive something like this as a gift. And here it is all mixed up. And here it is freshly poured in my cast iron. I let the whole mix brew for about 10 minutes and then I let it sit in the pot another 20. Why, I don’t know. I think I was being lazy. After all that laziness, I strained it and then let it cool in the fridge. 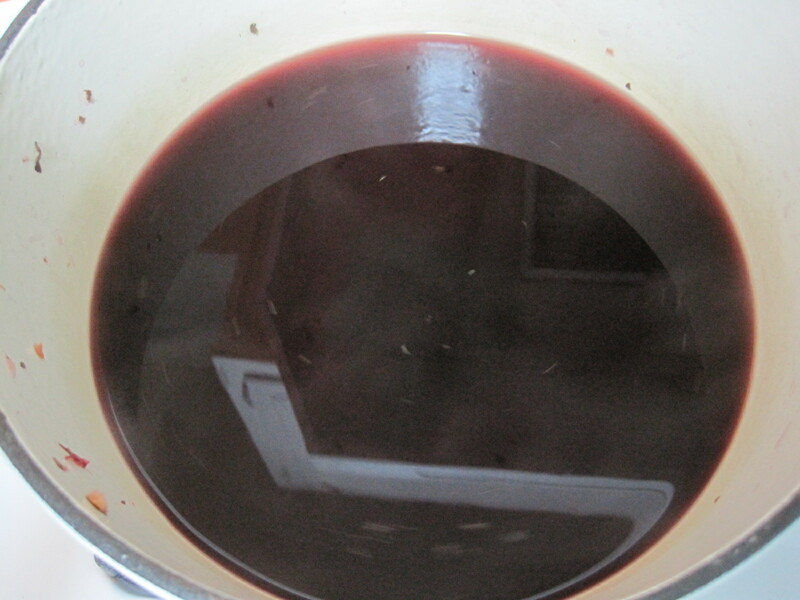 The mix was a beautiful purple color, tart, fruity and flowery at the same time. And the smell? Heavenly! Look at that pretty purple color. If you’re interested in making this blend as a gift , the cost is very affordable. 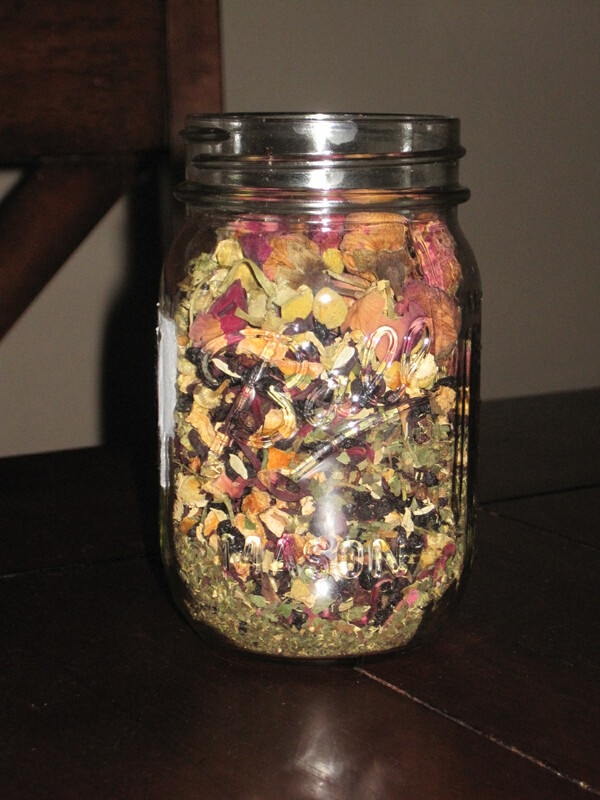 For this blend, the cost of all the herbs was about $32. For that price, you get a lot of material to work with. 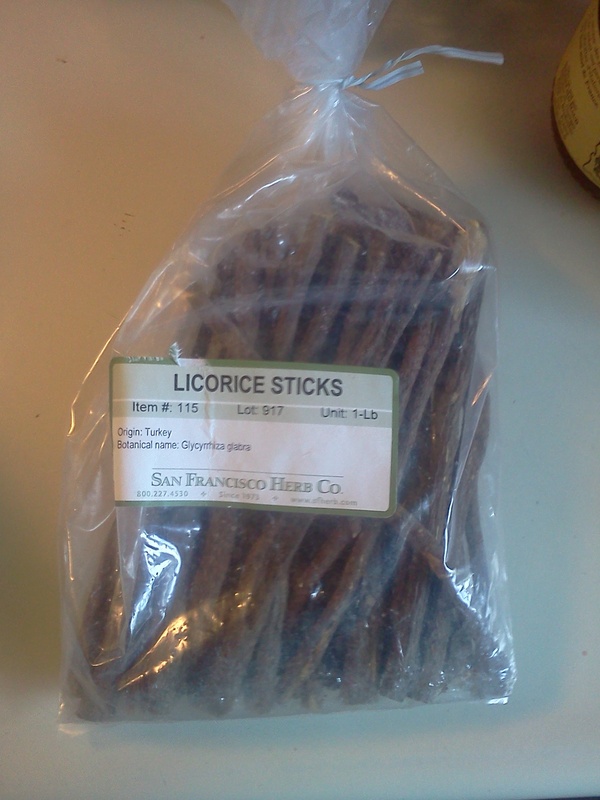 I purchase the majority of my herbs from San Francisco Herb Co. They have a store on the outskirts of the Mission in S.F. and I like to see what I’m buying. Here is a breakdown of the tea blend costs and sizes if you were to buy them from SFHC. If you filled mason jar with 8 ounces, you’d get 11 jars for $3.94. I usually buy The Republic of Tea and Tazo teas anywhere from $6 – $15 and on average they are only 1 ounce to 3 ounces full. Not only that, who knows how old the tea is? When you make your own blends, you control the ingredients and the quality. Can you tell I’m an advocate of making your own teas here? You can take it even a step further, and get sealable tea bags and fill them yourself. 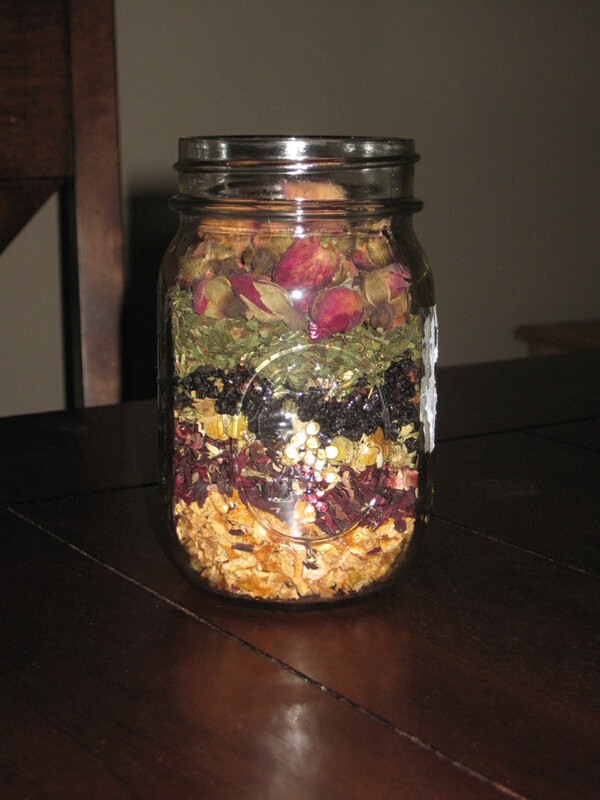 It would not be as pretty as loose tea in a jar, but would make it less messy for whomever you give the gift too.